via Book Review: WHEN GOD WASN’T LOOKING by Eunice Heath Tate. I went to a women’s literary conference some time ago, and one of the speakers said something profoundly heart-rending that I have thought of many times since. She states, “To live is to fall apart, to break pieces of ourselves off and send them into hiding.” While this may be true for some, and necessary for others in order to survive the unthinkable, this kind of self-fragmentation is not living. It is as the saying goes, “hanging in there,” because there can be no real joy in hiding behind pain. When the mind splinters, the pieces do not recede into nothingness or perpetual forgetfulness, but creates a constant struggle to blend with our being. The speaker of course, was referring to sexual abuse, but the same applies to physical, verbal, and emotional abuse. However, the issues, I believe, that contribute to sending victims of abuse into hiding, is the normalization of exploitation, the lack of outrage, the misplaced guilt, the burden of shame, the incredible silence, and the absurd rationalization. Perhaps it is no wonder then that one of the hardest thing for us to do, is to forgive someone who has hurt us deeply. The battle with forgiveness is an ancient one and it continues in the darkest corner on the battleground of our minds. The turmoil lies at the core of our misery. It gives cause for self-injury and the inability to accept God’s love. 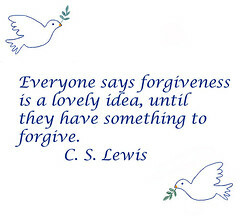 forgiveness, otherwise life just isn’t fair. Well, guess what? Life isn’t fair, and God did not say it was fair. But to retrieve those “pieces“ you have sent into hiding, you must forgive from your heart.